The Scott’s ferry restoration project is complete after 500 man-hours of work. A barge that once took settlers over the Rangitīkei River has been restored to shipshape 168 years later. From 1850, Thomas Scott used the flat-bottomed barge to ferry travellers, stock and freight across the river, between Tangimoana and Parewanui, before bridges were constructed. Scott’s ferry operated until 1987, when the port was destroyed in a flood, and lent its name to the village that sprung up nearby. An artist’s impression of the ferry in use. 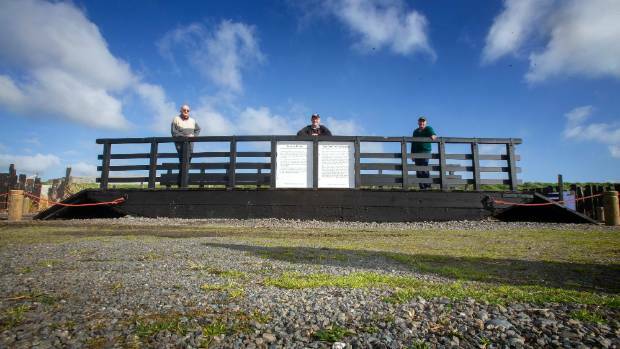 Bulls Museum member Tony Simms said the barge’s original totara and matai deck rotted and began crumbling, so the community rallied to save this small, but important part of New Zealand history. Only two other barges from its era have been restored, Simms said. He was working with the Rangitīkei District Council to install signage in Bulls to lure motorists off state highways 1 and 3 to Scotts Ferry. From left, builder Allan Giles, Bulls Museum member Tony Simms and project co-ordinator Kevin Ellery who led the restoration of Scott’s ferry. An official unveiling will be held in spring, when the weather was more consistent and comfortable for attendees, Simms said. Retired engineer Kevin Ellery has fronted the restoration project, heading up a team of volunteers including builder Allan Giles. “Their expertise was very important, especially to Heritage New Zealand, which required restoration work to be in keeping with the ferry’s original [construction],” Simms said. Scott’s ferry has returned to its original location. Ellery said his team put in 500 man-hours to restore the ferry and estimated it would have cost $60,000 to hire a contractor for the work. The team kept as close as possible to the ferry’s original construction, although much of it was now made of treated pine. “Unfortunately, we would never have got the donations to get native timber. Ellery salvaged the old totara planks for the site’s decorative fence and used an original beam to make a bench. He hoped to put a memorial plaque on the bench, dedicating it to Frank Nitchke,​ but was still seeking the family’s permission. Nitchke was the first to do repair and preservation work on the deteriorating barge in 1989, Ellery said. The community raised $7000 towards the project, the council contributed $2000, the Rural Women’s Group landscaped the display site and local businesses donated materials. The Uptown Theatre. Photo by Adam Prestigiacomo. News last month regarding plans to restore the Uptown Theatre came as a welcome surprise to Chicagoans and cinema lovers nationwide. It was hailed by theater enthusiasts as the crown jewel of the former Balaban & Katz theater chain. Until it was closed in 1981, the Uptown Theatre entranced the moviegoers who came through its doors because of its opulent decor and sheer size. As was the case with many other movie palaces that once graced the city streets throughout Chicago, the Uptown Theatre fell victim to changing owners, failing ticket sales, and general neglect. These factors and the difficulty in securing financial support led many to believe the theater and those like it were to live their remaining years in crumbling obscurity or be doomed to demolition. And yet, despite these obstacles and the passage of time, palaces like the Uptown Theatre have remained close to the hearts of loyal theater patrons, historians, and cinema lovers alike. More so than any other city in the country, Chicago was a critical player in the founding of the United States film industry, making the theaters left standing all the more significant. The early decline of Chicago film studios and movie palaces has largely erased this history from the public consciousness. The early days of the film industry are unsurprisingly as melodramatic as today. The initial novelty of Edison’s early single viewer “peephole” kinetoscope, developed by his employee William Kennedy Laurie Dickson, was quickly improved by more innovative inventors. By 1894 film projectors like the Lumière Cinématographe or the phantoscope invented by Walter Jenkins allowed large audiences to view a film projected onto a screen. Jenkins, thought to have staged the first public film screening in a field in Richmond, Indiana, in 1894, unfortunately fell in with fellow inventor Thomas Armat to improve the phantoscope design. After breaking their partnership, Armat sold the new design of Jenkin’s projector, the vitascope, to the Edison Company. It was then streamlined and distributed and the movie theater was born. It was around this time that magician and vaudeville theatrical troupe manager, William Selig, began making and exhibiting a series of shorts, industrial films and travelogues for small storefront theaters called nickelodeons under the Selig Polyscope Company out of Chicago. Selig’s was one of the first motion picture studios in the country. His decision to start his own company came around 1894, when visiting an exhibition in Dallas, he came across the kinetoscope and decided to find a way to profit from the idea without having to pay Edison a patent fee. As luck would have it, Selig was able to create and market his own film camera technology after meeting a metalworker who had repaired the Lumière brothers’ film cameras, furthering the muddled and underhanded origins of early film technology as it grew more profitable. The production facility was located at Irving Park Road and Western Avenue, covering three acres of land and employing well over 200 people at its peak. The Selig Polyscope Company, however, wasn’t the only studio in Chicago for very long. Soon came the American Vitagraph Company in 1896 and in 1907, inventor George Spoor and his business partner Gilbert “Bronco Billy” Anderson, an actor best known for his western films, partnered to open Peerless Film Manufacturing Studios, soon changed to Essanay. The company was originally situated at what is today 1300 N. Wells. Their first film starred the building’s janitor on roller skates and was an extremely profitable success. Within a year the studio was prosperous enough to move into its larger, permanent home at 1345 W. Argyle, and became the largest and most prolific studio in the United States. Essanay and its subsidiary studios around Chicagoland produced nearly 1400 films in its 10-year history, most famously 14 short comedies by breakout British star Charlie Chaplin in 1915 and the very first screen appearance of Sherlock Holmes in 1916, adapted and played by William Gillette. This was based on Gillette’s already popularized stage play, produced with the blessing of author Sir Arthur Conan Doyle. This film was thought to be lost for decades until a print was discovered in France in 2014. It has now been screened in the very room where it was shot at 1345 W. Argyle. In a shocking turn of events, Chaplin left Chicago after a year due to its unpredictable weather. He made his way out to the burgeoning studios in California and was followed by Spoor and Anderson for the same reason when the Chicago studio closed in 1920. With Chicago-based studios like Essanay and the Selig Polyscope Company gaining traction and distributing films nationwide, the city soon became the home of the film exchange, or film rental house. These “houses” gave exhibitors the opportunity to rent films for use in their theaters, allowing businesses to change films more frequently. By 1907, Chicago had more than 15 film exchanges, which in effect controlled roughly 80 percent of the film distribution market for the entire United States. At the time of this dominance over the market, Chicago was also the home of the largest theater chain, Balaban & Katz. In business from 1919 to 1952, Balaban & Katz built increasingly elaborate “movie palaces” in which theater patrons were able to watch films on massive screens with thousands of seats available, cementing the transition of film from sideshow novelty to mainstream entertainment. While in business, Balaban & Katz built around two dozen of their majestic movie palaces across Chicago, and later throughout the Midwest. The Portage Theatre on the northwest side. Photo by Adam Prestigiacomo. Movie palaces soon dominated the entertainment industry. Films were easily replicated and distributed, and even the opulent theaters were affordable and thus accessible to low income Americans. Balaban & Katz employed a number of methods to ensure their theaters were the most popular. First and foremost was the grand and gilded interior architecture, based on the grand opera halls of Europe. On the exterior of most palaces were story-long vertical signs lighted so brightly that Chicagoans couldn’t help but turn their attention towards the theater. The buildings themselves were equally alluring thanks to their striking and exotic architecture, employing Spanish, Italian and French-inspired facades. Inside, troops of ushers uniformed in red velvet coats and white gloves stood ready to help guide patrons from the lobby into the main theater, where a number of concessions and entertainment venues were showcased, including performances by live orchestras, organists, and of course the newest feature-films and shorts. The palaces in Chicago were legendary and eventually their look and atmosphere were imitated by other businesses throughout the country, though rarely as opulently as Chicago’s. The sensation of sitting in these historic palaces in the city that gave the American film industry its start is a feeling that only Chicagoans can know. When they were constructed, they were meant to remain iconic for generations to come, but this unfortunately was not the case. Eventually, as the California studios grew and flourished, many studios made the same shocking decision as Chaplin. Producers and their talent moved their studios to the sunny west coast, away from Chicago’s harsh winters and unpredictable weather patterns. Movie palaces followed suit as industry in the city slowed. By the mid to late 20th century, the great movie palaces that once graced the city streets and acted as focal points of their neighborhoods began to disappear one by one. The Montclare Theatre on the far northwest side, a high-end destination of its time, spent its final years in complete disrepair, becoming a popular spot for squatters, gangs and vandals. It wasn’t until the mid-1990s that the once beloved theater was torn down and the lot converted to storefronts and residential properties, a common fate for once thriving and beautiful structures. Just to name a few, the Drury Lane Theatre in Lakeview, the Granada and Adelphi Theatres in Rogers Park, the Brighton of Brighton Park, the Terminal Theatre in Albany Park, the Shore, the Hamilton and the Jeffrey Theatres in South Shore and Beverly, and the Englewood are gone without a trace. Many others have been gutted and refurbished to varying degrees, such as the Calo in Andersonville, now home to The Brown Elephant resale shop, or the the Admiral in Albany Park, infamously converted to an adult entertainment venue. Walking through most Chicago neighborhoods, those who know to look will see former palace facades now converted to commercial storefronts. The Pickwick Theatre in Park Ridge. Photo by Adam Prestigiacomo. Fortunately and improbably, some of these beautiful movie palaces of the roaring ‘20s have managed to survive. The Portage Theatre and the art deco masterpiece in Park Ridge, the Pickwick Theatre, screen films for audiences daily. Broadway musicals and other live entertainment now fill the marquees and the auditoriums of the Oriental, Cadillac and Chicago theaters in the loop, in the previously illustrious Theatre District, which younger residents might not remember were neglected for decades. Movie palaces aside, some cozy neighborhood theaters from the era remain as well. A prime example is the Music Box Theatre, an institution that continues to enthrall guests. Operating in the Lakeview neighborhood since 1929, the Music Box Theatre keeps the spirit of old movie theaters alive thanks to features like a live organist accompanying silent film screenings, a red velvet curtain rising to introduce films in the main theater, and a ceiling filled with stars, allowing audiences to watch films in a calm and atmospheric environment. Perhaps an even better means of interacting with the past would be in meeting “Whitey,” the theater’s resident friendly ghost. Thought to be the spirit of the Music Box’s former manager, moviegoers can typically find Whitey around Aisle 4. The Balaban & Katz Chicago Theatre, the flagship of the Balaban & Katz chain, changed hands numerous times but failed to secure the necessary support for renovation. It was saved partially due to Roger Ebert’s fervent plea to save it. Now owned by the Madison Square Garden Company, the Chicago Theatre is a concert and performance venue restored to its original splendor. Only Chicagoans know and remember its true history as a cinema while many believe it was built as an opera house. It wasn’t. While Chicago’s pioneering film industry couldn’t be sustained, it has picked up in recent years due to arts initiatives bringing television and movie projects to Chicago from Hollywood studios. The past, though gone, echoes in the standing survivors of the ‘20s and ‘30s. These palaces and neighborhood landmarks continue to be the shining beacons of their community, lighting up the streetscape, and offering escape and enchantment that begins the moment you set foot through their doors. We hope you enjoyed this feature about Chicago’s history as a center for film production and the home of the movie palace. If you did, please consider supporting Third Coast Review’s arts and culture coverage by becoming a patron. Choose the amount that works best for you, and know how much we appreciate your support! Our first project was the historic Chief Theatre neon sign, which came back to life on Nov. 29, 2013. The sign came back to life 20 years after devastating fire took the Chief Theatre from us on March 20, 1993. Since then, Old Town Pocatello has seen 11 neon signs come back to life. We now have 25 historic signs in Pocatello and the number is still growing. We are currently fundraising for the Fred’s Photo sign. We still need to raise $4,000 to complete this $7,000 project. Fred Cuoio opened his business at 510 E. Center St. in 1938 and operated it for 72 until 2010 when he passed way at 96. The beautiful neon sign will be placed at the Old Town Pocatello Pavilion at Fremont and Union Pacific Avenue. This will help create the “Neon Alley” we’ve been talking about over the past two years. Other signs on UP Avenue currently include the Molinelli’s, The Whitman and Greyhound Bus Depot signs. The Buster Brown Shoes sign was on Hudson’s Shoes at Center and Main from 1950 until about 1970. The sign was discovered in the basement of the Pioneer Block Building last winter. The sign was donated to Relight the Night by the building owner. It is currently in storage and our plan is to place it at the southwest corner of Center Street and UP Avenue so it can be viewed as traffic headed west exits the underpass. Relight the Night must raise $8,000 to save this historic neon beauty. Buster Brown will shine brightly just 100 feet from its original Main and Center location and become part of our “Neon Alley” as well. The Hotel Yellowstone sign is scheduled to be repaired and relit within the next month. Relight the Night has worked with the building owner to develop to a plan to repair the sign. A digital timer like those we have on many other historic neon signs in Old Town will also be installed. Like the Chief, the Yellowstone is an icon in Old Town and can be seen for miles. Relight the Night has had the Teamsters Local 983 neon sign in storage since 2014. The Teamsters gave the sign to RTN when they moved from their office at 518 E. Center St. to the AFL Union Hall at 450 N. Arthur Ave. Last December I approached Tonya Carlson, Teamsters Secretary/Treasurer, about placing the sign on the back side of the AFL-CIO building facing Main Street. The Teamsters have recently received permission from the national AFL-CIO office to install the sign on the building. The sign was brought of storage at the Pocatello Regional Airport last week and will be restored before installation in the near future. Relight the Night has been actively involved and worked with sign owners in the restoration and repair of ten historic neon signs since November of 2013. They include the Chief Theatre, Chopstick Café, Greyhound Bus Depot, Key Bank, Meyers Shoe Repair, Odd Fellows, Pocatello School Indian, Bannock Memorial Star and The Paris. We are also currently discussing the restoration of Harrison’s and Scott’s neon signs with the building owners and hope see those restorations in the future. The backbone of our neon sign inventory in Old Town has always been the privately owned neon signs that have been meticulously maintained by our Old Town business owners over the years. Molinelli’s Jewelers, The Whitman, Bangs Stationary, Buddy’s, Deleta Skating Rink, Elmer’s, Maag Drug, Pocatello Electric (LED restoration of original), Reel Theatre, Garrett Freight Lines, East Idaho Home Interiors and The Office Bar and Grill must be given credit for their efforts to keep their signs shining brightly. Relight the Night has also created an inventory of non-working historic neon signs as well. It is not likely these signs will see restoration but they still preserve the history that surrounds them. They include Cowboy Oil, Idaho Motel and Thunderbird Motel, Owl Club and others. Our thought is that if we don’t at least think about their restoration, it can never happen. Relight the Night has received national recognition for our historic neon restoration efforts. Recently, the American Sign Museum in Cincinnati contacted us and asked us to be involved in an advisory group of 14 neon restoration efforts across the nation which will meet next year. Neon signs are not just art and beauty. The history that surrounds our Old Town Pocatello neon treasures can never be forgotten as long as they shine brightly every night. Please support our efforts to restore Fred’s Photo and Buster Brown. Mail your contributions to Relight the Night, PO Box 222, Pocatello, ID 83204 or use GoFundMe/Relight the Night. ST. PETE BEACH, Fla. — There is new hope for an old theater on St. Pete Beach. The iconic Beach Theatre on Corey Avenue was a staple in the community for more than 70 years. Low attendance and financial woes caused the owner to close the doors in 2012. Mayor Alan Johnson said the owner passed away, and the keys to the theater have been locked up in the legal process for the last few years. He hopes that will soon change. “We’d love to see it come back, and everybody tells me they want the theater, they want something there as an entertainment facility,” Johnson said. Johnson and the city commission want to work with the owner’s family and help them find the right person to take over. He wants the next owner to preserve the theater’s history and envisions providing anything from movies to live entertainment, and a mixed-use space. “We don’t have an attraction on the beach. And anything like the theater could bring people here for reasons other than the beach and let them understand that we’ve got a great little culture here,” Johnson said. Burke Prevratil owns an antique store next to the theater and remembers when it was thriving. “I saw all kinds of pictures there. My favorite memory was seeing Monday Night Football games in there,” Prevratil said. St. Pete Beach business owners and city leaders hope the theater will bring more business to the area. The mayor said the idea is still in the very early stages but hopes to see something in place at the Beach Theatre sometime in the next year. Alexandria’s MetroStage will open with Athol Fugard’s most recent play, and then bring back three of its most acclaimed productions to round out its 2018-2019 season. The Fugard is The Painted Rocks at Revolver Creek, the “tender, ruminative new play” (Christopher Isherwood of the New York Times) about a Black South African who supports himself by painting artistic designs on rocks during Apartheid, and his young apprentice who comes back as an adult, post-Apartheid, to restore his work. Veteran MetroStage director Thomas W. Jones will helm this play, which will run from August 30 to September 30, 2018. The critically- and popularly-acclaimed Rooms will be next. Paul and Miriam Goodman’s two-actor musical is about an introverted, hard-drinking musician who falls in love with a lyricist and forms both an artistic and a personal partnership with her. Rooms, which MetroStage developed along with Rochester (NY)’s Geva Theatre, went on to New York and toured nationally. DCTS’s Steven McKnight called Rooms “the most emotionally real and authentic musical this reviewer has ever seen” in this review. From October 4 to November 4 of this year; Rick Hammerley will direct. For the holidays, MetroStage will reprise Catherine Flye’s Christmas at the Old Bull & Bush, a visit to a circa-1910 British pub for an evening of music and nonsense. “[T]here is a skillful arc in devising the evening’s entertainment from the simple pleasures such as the American borrowed ‘Bicycle Built for Two’ to the most moving part of the evening when we were literally taken into the trenches of World War I,” DCTS’s Susan Galbraith said in this review. I recommend maximizing your enjoyment by sitting near the front so that you might be selected from the audience to play Tiny Tim. If so selected, be sure not to blow the iconic line. From November 20 to December 23, 2018; Flye will direct. MetroStage will cap off the season with Three Sistahs, Janet Pryce’s application of themes from the similarly named Chekhov play to an African-American family in the late 1960s. DCTS’s Alan Katz called Three Sistahs “a gift to DC theater, local and incredibly orchestrated” in this review. The protean Thomas W. Jones supplies the book and lyrics; William Hubbard writes the music. No director has been announced for this show, which will run from January 24 to February 24 of next year. Tickets are available at the MetroStage box office, 703.548.9044. MetroStage is still producing from its N. Royal Street theatre in Alexandria, VA. The announced move to another venue has been postponed for a year.